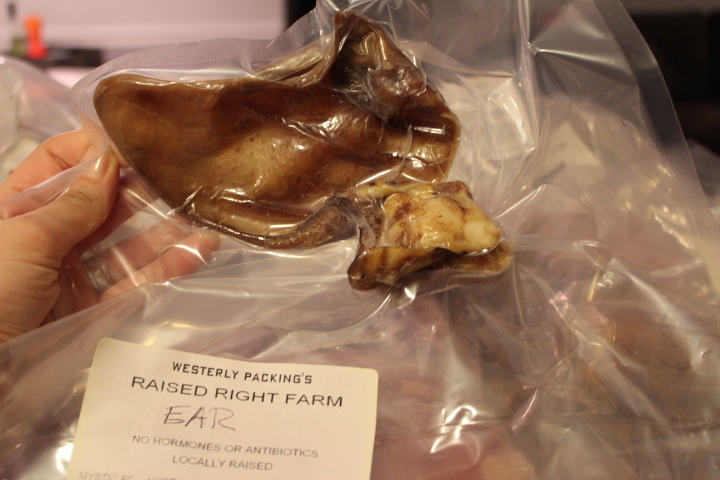 Last Spring, after over 3 yrs of living in the area, I finally ventured over to Westerly Meat Packing. This is a local team of superstar butchers tucked off the main road but still incredibly easy to get to. I don’t know why it took me so many years to get over there but I am wicked glad that I did. Shortly thereafter, I found out that they also own and operate a small farm called Raised Right Farm in a neighboring town, I practically did backflips (maybe just in my head). 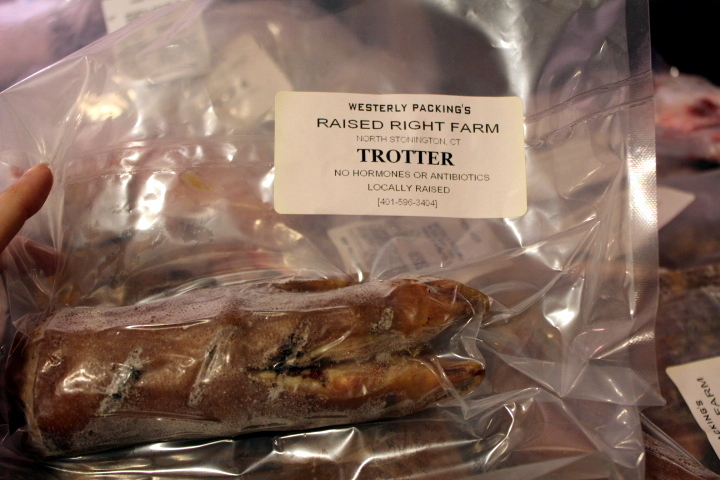 Check out their site: www.westerlypacking.com/Farm-Raised.php! Go ahead and judge away, but stuff like this gets me seriously geeked up. As a meat eater and a young adult, I am now educating myself on where my animal protein comes from. The more I learn the more motivated I am to be responsible. These animals may serve one end purpose but they deserve to be respected and live a healthy, humane, natural life. 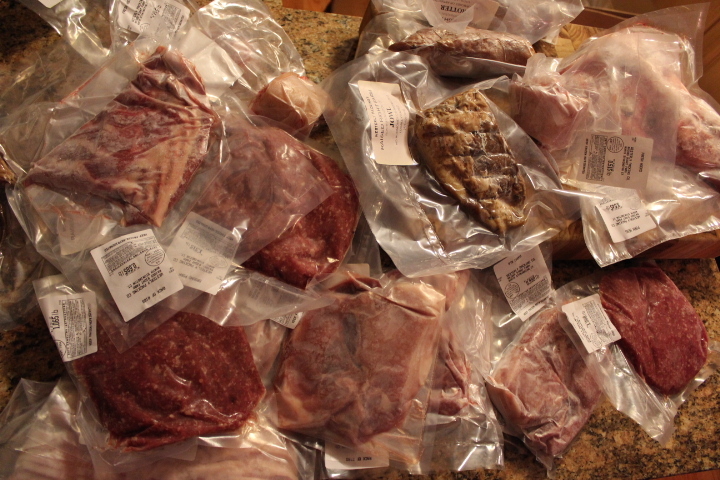 The result of pasture raising these animals is highly flavorful meat, less fat, and more nutrition all without the worry of antibiotics, hormones, or chemicals. Better for the animal, better for us, and better for the environment. For a deeper exploration of this topic, read an article posted by New England Grassfed earlier in January: www.animalwelfareapproved.org/wp-content/uploads/2012/07/The-Grassfed-Primer-online.pdf. I will warn you – it’s long, so maybe just a few pages at a time if your attention span is anything like mine. Raised Right Farm offers pork and beef, so for our first experience I decided to add my name to the list for a pig. This was around 6-8 months ago and just last week (or was it the week before?) my phone rang with news that one was finally available. Originally we intended on splitting a full pig but in the end we wound up with a half split three ways. The next part of the process was filling out a “cut” sheet, my initial take on it was pretty overwhelming but the butcher walked me through everything and I also came prepared with a diagram. Our half of the pig was 80 lbs hanging with organs removed. Shoulder Picnic: I chose to grind it. Rib Chops Bone-In, (2) per package, 1″ thick. They told me it would be about a week between order and pick-up so the next challenge was getting ourselves a freezer. Lucky for us, my boss was looking to unload his standup that he hadn’t had use for in quite some time. I rarely have this kind of luck and my husband – never. We were psyched to have one land in our laps, free of charge. On Friday I went straight from work to Westerly Packing to pick up our goodies. 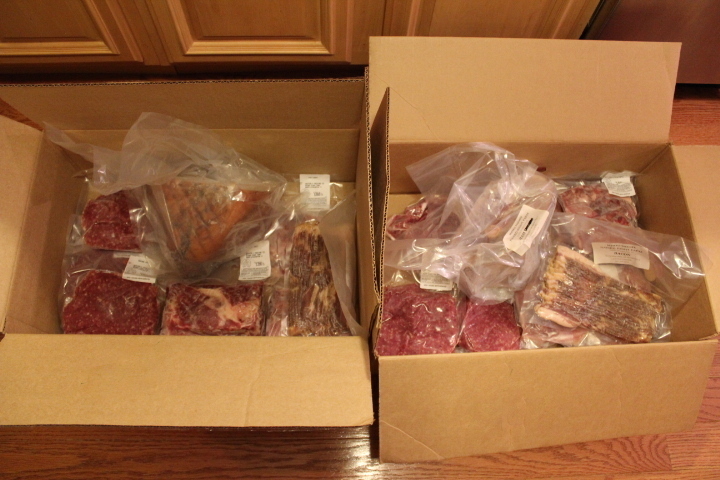 Everything came vac-packed and heat sealed, nicely labeled and boxed. 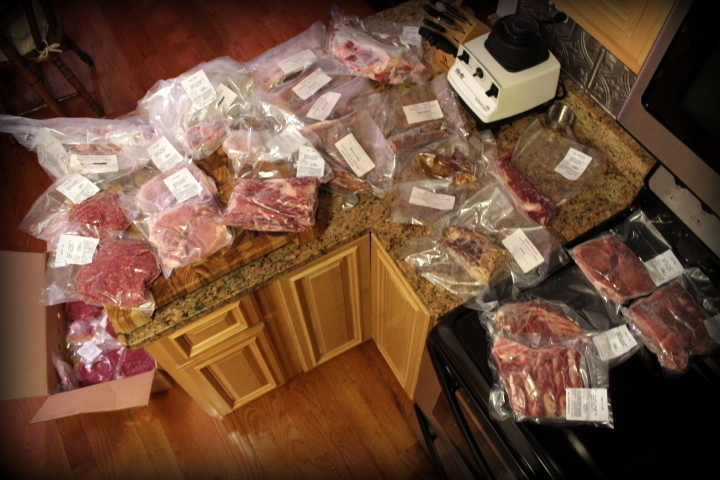 You may have been watching the Superbowl but I was divvying up pig meat and I liked it! I wasn’t lying when I said my kitchen was small, this is me up on a chair trying to capture the scene with half of the yield still packed in the box on the floor. A portion of my childhood was spent raising both meat hens and laying hens, for a while we raised turkey’s too. 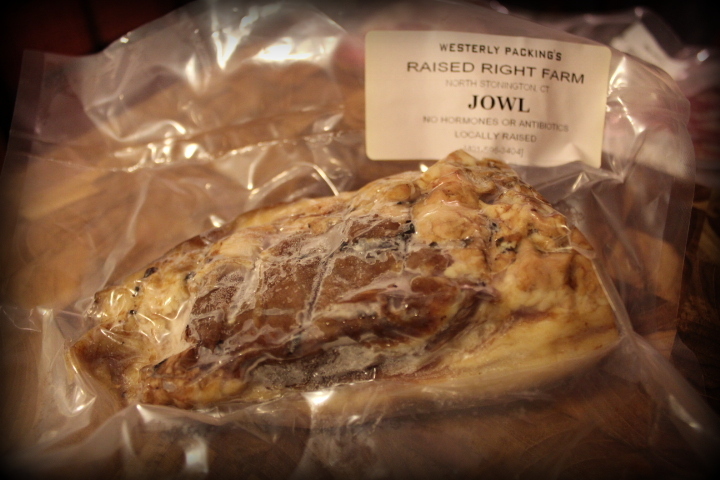 Being very familiar with the difference in both texture and taste with poultry, I am so excited to try this pork!! Everything is better with bacon…that’s a fact. Who loves a good BLT? It’s at the top of my sandwich list for its simplicity and ability to throw me into nirvana. Check back in the near future for my take on the BLT – drool, drool, drool. What to do with this little bit? Add it to chili or stew?! This one – I’m not so sure of?! 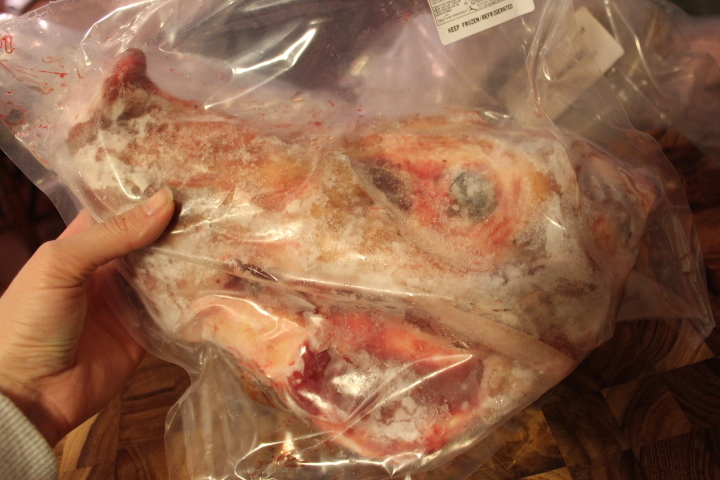 Yup – that is one half of a pigs head…eyeball and all. I mean, the oink is still attached and I am not immune to the fact that this used to be a squealing pig. Wilbur?? Of course no one else wanted it, big surprise (sniffle). I couldn’t forget about Keiko – she get’s her own special smoked pig ear chew!! 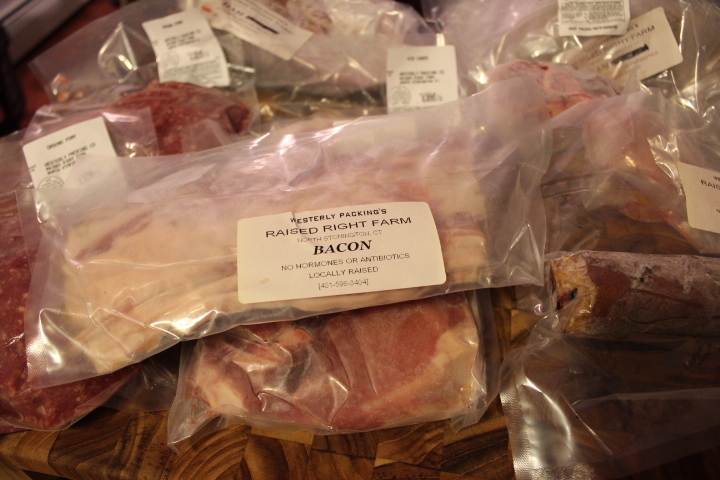 This entry was posted in I Can Do That, Local Goods and tagged pasture raised, Pig Share, Pork on February 4, 2013 by NewEnglandGirl. You are like Andrew Zimmern with your “mixed box of parts”. I can not WAIT to see what you come up with! You crack me up…. love that you appreciate the food you know the origins of…. and what goes into raising it. Glad you enjoy my pork cut chart which you used on your post. People can see pictures of our family’s pastured pigs on my blog at SugarMtnFarm.com along with many articles about making the most of pigs and farm life here in the mountains of northern Vermont. Hi Walter! Thank you for putting this chart out there, it was incredibly helpful. I hope my readership will refer to your blog to learn more!